Subject: LongIsland.com - Your Name sent you Event details of "Asbury Short Film Concert"
Asbury Shorts USA presents its nationally recognized touring exhibition: “The 38th Short Film Concert ” at The Madison Theatre, located on the campus of Molloy College in Rockville Centre, on Friday, April 5, 2019. The first film blasts onto the screen at 7:30 p.m. This showcase of major award winning short films is strongly recommended for ages 16 and way above. What began in a church basement in Westbury, New York in 1980 has now grown to become a nationally touring presentation of the world’s best independent short films. 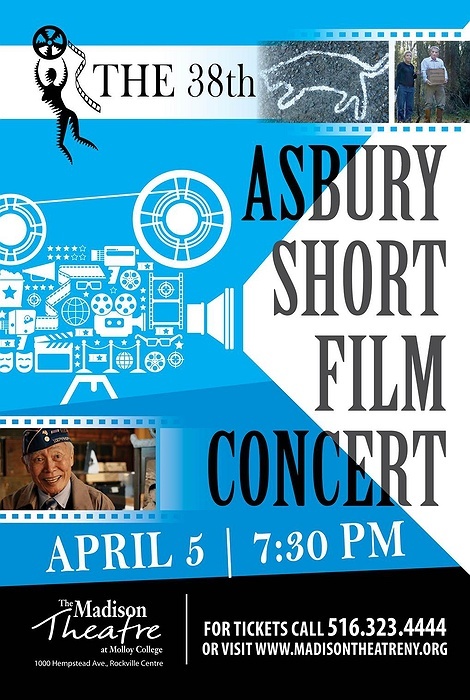 Find out more about Asbury Shorts at www.asburyshortsconcerts.com. The Madison Theatre at Molloy College is located at 1000 Hempstead Avenue in Rockville Centre, Long Island. For reservations and show information go to: www.madisontheatreny.org or call 516-323-4444.